This past Thursday morning, my iPhone alarm went off at 4:30 in the morning. On most days, the alarm going off anytime before 6 am would result in a very sleepy and confused response from me, knocking the phone off the bedside table in my attempt to shut off the annoying ring tone. That morning, though, I was instantly wide awake. 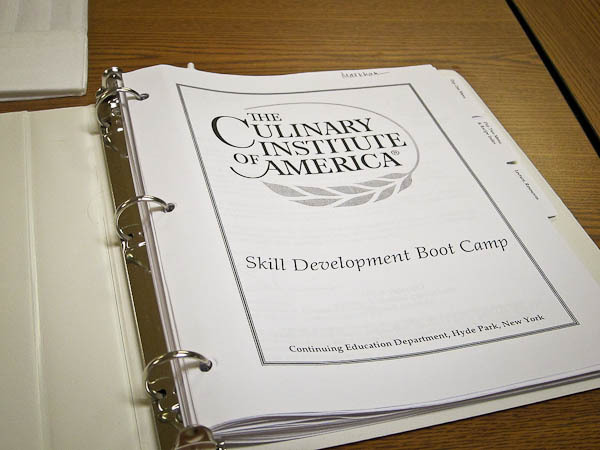 It was my first morning of boot camp at the Culinary Institute of America. I’ve wanted to take a real cooking course for some time now. Everything I know about cooking comes from reading cookbooks and food magazines, being observant around people who know what they’re doing, and practicing as often as I can. But I’ve been craving real instruction. When I first learned about the CIA’s boot camp offerings for food enthusiasts, I knew I had to sign up for one. The four- and five-day camps are pretty expensive, so this two-day course seemed like a great way to try it out without feeling overly guilty about the cost or the time spent away from home. I’ll tell you right now that I was not disappointed in the experience. 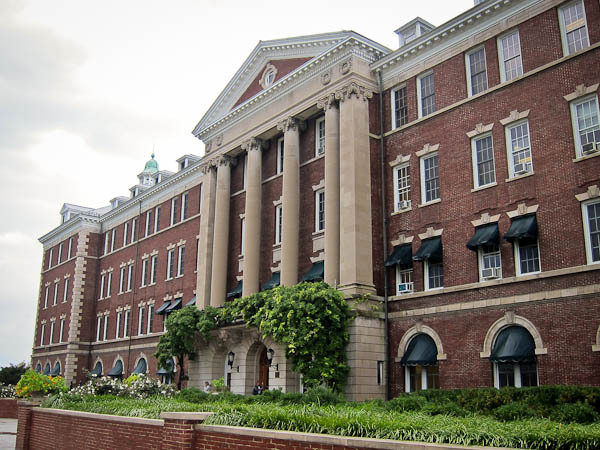 Day one began with a dark early morning drive in the rain, through the Hudson River valley, from my friend’s home in New Paltz to the stately – and more than a little intimidating – campus of the CIA in Hyde Park. After finally figuring out where to park, I gathered my nerves and left the safety of my tiny rental car to enter the great unknown of my first day in a professional kitchen. Fifteen of us were enrolled in the course. There were two young people in the group, both probably just out of high school and both aspiring to become chefs. The rest of us were, let’s say, a bit older than that. 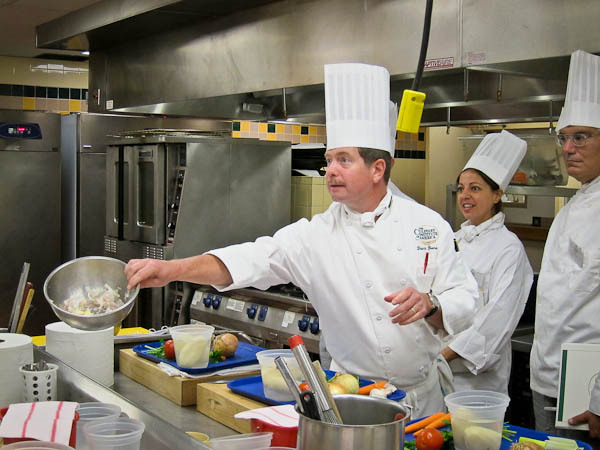 We came from a variety of professions and stages in our careers – teacher, personal trainer, international relocation specialist, physician, retiree – and none of us had worked in the food service industry. The one thing we all had in common was a shared passion for food and cooking. And that was enough to bring us all together during those two days. After a brief orientation and a fantastic, made-to-order, breakfast prepared by the K16 culinary students, we began our day with a one hour lecture by Chef Dave Bruno. 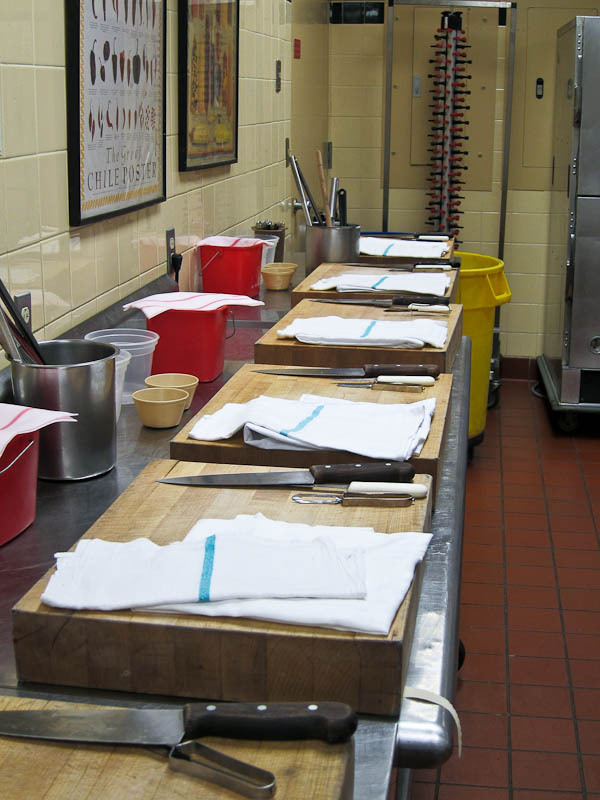 He reviewed the basics of mise en place (“everything in place”), knife safety and various knife cuts, and dry heat cooking methods using fats and oils. We were divided into four groups – three teams of four and one team of three (my team) – and we reviewed as a group the recipes we would be responsible for preparing that morning. Those recipes would be transformed from words on a page into finished dishes that would then serve as our lunch. 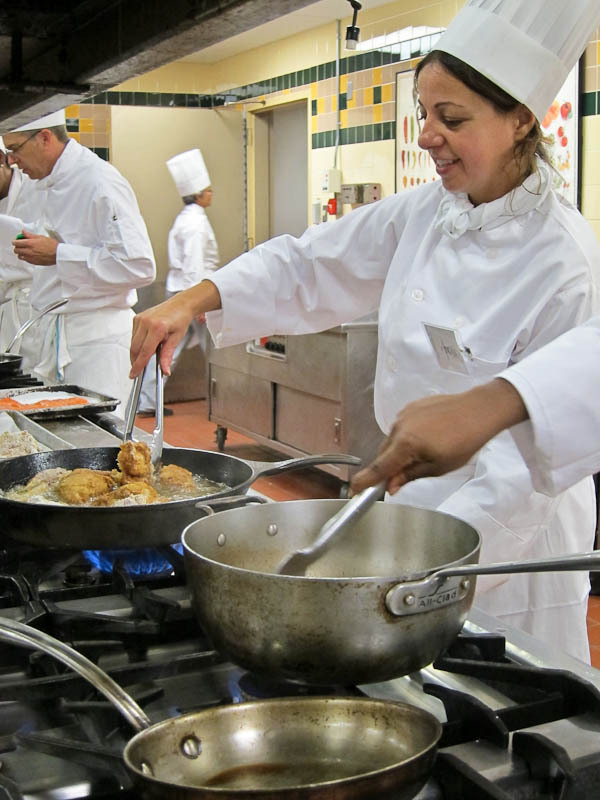 Team Two – the team consisting of me, Latoya, and Rose – was assigned buttermilk fried chicken with country gravy, french fried potatoes, and a chopped steak house salad with red wine vinaigrette. Other teams were responsible for preparing wiener schnitzel, pan-seared salmon, sautéed pork cutlets with mushroom ragout, and various side dishes to accompany each protein. While we were oriented briefly to our recipes, we were not really oriented to the professional kitchen we would be working in. We struggled to find ingredients for our dishes. Spices were missing and not where they should be. It took us several tries to figure out how to turn the gas range on without turning out the pilot light by mistake. It was only after an hour in the kitchen that I figured out where the sink for fresh water was located. We got behind schedule. 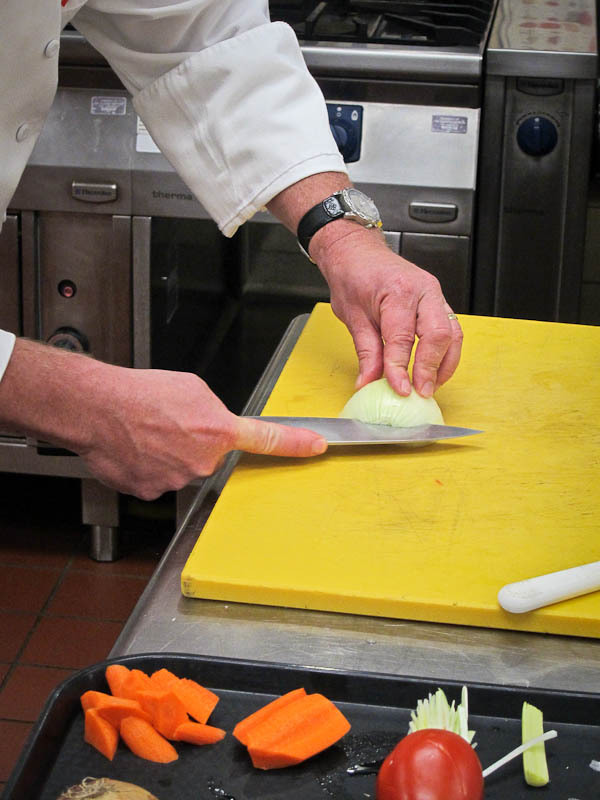 We were hot, pink-cheeked and pouring sweat underneath our no-longer-crisp chef’s jackets. I felt – and probably most of us felt – an intense pressure to not screw up, to get various components of the menu done on time, to not make mistakes. 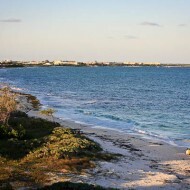 We were in unfamiliar territory, and I was stressed out and overwhelmed. 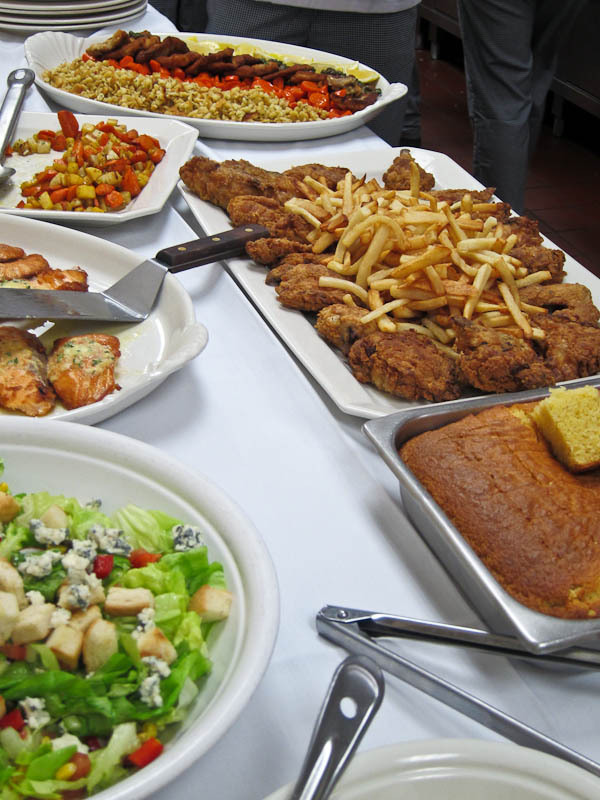 With no time to spare, and hardly time for a bathroom or water break, we plated our fried chicken and french fries and salad onto large platters to serve the group. We hastily prepared a demo plate for the review and critique by Chef Bruno that would come later. The other teams did the same, and the white tablecloth-covered table soon was overflowing with beautiful food. 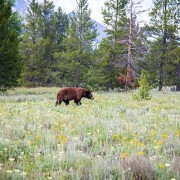 As a group, we stood back, admiring the abundance of food we had prepared. We were exhausted, sweaty, hungry…and proud. We were very proud. What a fun family day! There is a place close by that I will have to go do my own blueberry pickin’. I love spring and summer! What a dream! You are going to be busy cooking with all those berries! Yum. Those blueberries are making my mouth water. There could be pie in my future!! Looks like such a nice little family outing! I’m waiting for my backyard blueberries to turn ripe for the picking! Unfortunately, I’m headed up north soon so I worry I won’t be around come harvest time in my neck of the woods. These fresh blueberries look absolutely delicious! What great photos and it looks like everyone enjoyed themselves. Reminds me of picking berries as a little kid with my Grandmother. Happy Sunday!! Takes me back many years to North Carolina and doing the same thing with my kids; we always looked forward to picking a bunch of blueberries to have both fresh and then also freeze for the remainder of the year. Nothing quite like the berries fresh from a farm is there? This is a magical day and I’m so happy that you shared it with us. The blueberries look fantastic and it looks like you had so much fun! Now I can’t wait to see what you do with them. I’ve been wanting to find U-pick blueberry and blackberry farms around town. Thanks for sharing! What a fun day! 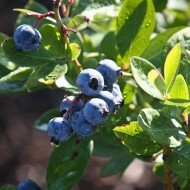 I still have fond memories of blueberry picking with my family…your kids will remember these days forever. Can’t wait to see some good recipes! I love it, looks like such fun! I love the new look, MJ. As always, Lindsay does a great job!